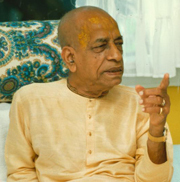 Srila Prabhupada wrote, “Throughout the world there is no institution to impart education in the matter of spiritual understanding. So we are going to open a big center in Mayapur where this education will be internationally imparted. Students from all parts of the world will go there to take education in this important subject.” The Jaipur Institute aims to fulfill this desire of Srila Prabhupada by establishing Mayapur as a center for higher education and training. The Jaipur Institute is a leading international centre for education and training in the theistic philosophy, practice and culture presented in the essential Vedic scriptures taught by Sri Chaitanya Mahaprabhu as translated and explained by Srila Prabhupada. The institute will also provide advanced study opportunities for understanding the writings of the predecessor acharyas, the primary books of the four Vaishnava sampradayas and important Vedic scriptures. Students from all parts of the world will thus be trained to be qualified teachers, preachers, leaders, theologians and scholars to distribute the unique contributions of Sri Chaitanya Mahaprabhu to humanity. The JIHE in Jaipur was established to fulfill Srila Prabhupada's desire for an educational institute in Jaipur. The JIHE in the Jaipur (Gupta-Vrindavan Dham) provides an ideal facility and atmosphere for you to improve your sadhana, develop your devotional qualities, engage in serious study, associate with senior devotees, and receive training in practical skills relevant to management and preaching. The JIHE also aims to preserve and disseminate standards Srila Prabhupada set for acting in Krishna consciousness and to deepen devotee's understanding, realization and appreciation of Srila Prabhupada's teachings and movement. Thus, the Krishna conscious culture and values that Srila Prabhupada gave us can be passed on to successive generations. All courses are well researched and taught by senior devotees who have a deep understanding of the subject. Contact Yadunandana dasa at yadunandana.sdg@pamho.net or college@pamho.net. This course comprises and in-depth study of Bhagavad-gita, Sri Isopanisad, Nectar of Instruction and Nectar of Devotion. It has been designed for devotees who have been seriously practicing Krishna consciousness for at least a year, and have basic sastric knowledge and understanding. The course has a modular design, which means you can take separate Modules spread over a few years to suite your schedule if you are unable to complete it in one semester. A Preliminary Self-study guide is available, once you have registered, to enable you to prepare ahead of each lesson, and also before coming to Jaipur. You can find out more about these materials and preparing for your study in Jaipur in our Resources section.